Though Philip Taylor enjoys cooking French cuisine, I’ve asked him today to give us an easy to make recipe in the kitchen. In his book, Teaching Philip – Book 8 of my Tarnished Saints Series, he is making Chicken Satay with Peanut Sauce when Taylor comes to his door asking him which dress to wear on a date with another man and catches him wearing an apron. Philip, can you tell us how to make it? Philip: Yes, Elizabeth, I can. But first I want to clarify that the only reason I was wearing the apron was because I didn’t want my clothes splattered with grease, and because the sweet old Bailey sisters gave it to me and I didn’t want to hurt their feelings. Even if Taylor thought I was gay – I’m pointing out that I am not. Elizabeth: We know, Philip. And you getting married to Taylor proved it. Philip: Good, now here is the recipe, so easy that even Taylor can make it – but don’t tell her I said so. 1 package of chicken tenders. 1/2 fresh lime squeezed into the sauce. 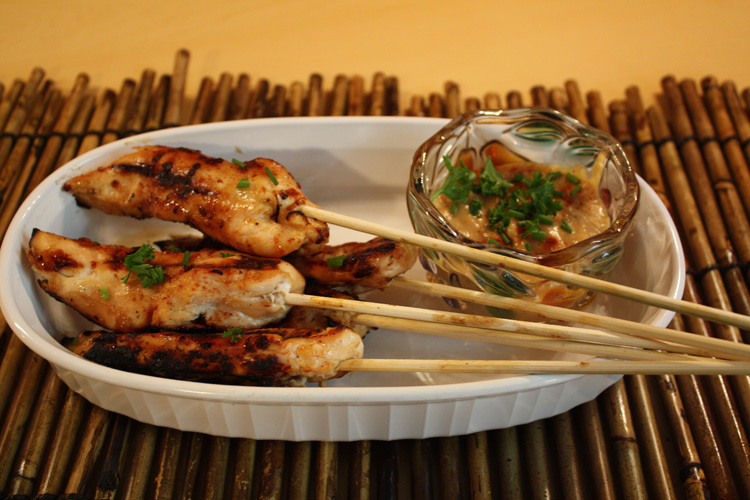 Serve with dipping sauce as an appetizer or with jasmine rice as a dinner. Click book cover to buy now.